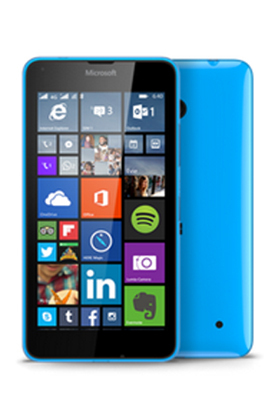 The Microsoft Lumia 640 measures 5.56 x 2.84 x 0.35 inches, weighs 5.11 ounces and has rounded corners and flat sides. The device, which features a polycarbonate smooth finish frame, has an exchangeable back cover and is available in glossy cyan blue, orange, white and matte black. Microsofts Lumia 640 has an 8 megapixel main camera with LED flash, which can shoot 1080p video at 30fps, and a 1 megapixel selfie front camera. With 1GB of RAM and 8GB of storage, which is expandable up to 128GB via microSD, the Lumia 640 is powered by a 1.2GHz Qualcomm Snapdragon processor. With Windows 8.1 pre-installed and the Lumia Denim update, the device features Outlook, Skype, Cortana and OneDrive. The Lumia 640 comes with a one year subscription to Office 365 Personal. The subscription also includes 1TB of storage on OneDrive and 60 minutes of Skype Worldwide calling per month. The Lumia 640 arrives with a 5 inch IPS LCD display with a resolution of 1280 x 720 which gives a pixel density of 294ppi. Protected with Corning Gorilla Glass 3, the easy to clean display has sunlight readability enhancements and great viewing angles. The device has a ClearBlack screen providing bright colours and keeping black looking black. Nokia Lumia 830 Wireless Charging Flip Shell In Stock Now!